Samsung has brought out a mobile tablet to enter the market controlled by Apple called the Samsung Galaxy Tab. The one problem that all of these devices share it accessing the Internet over unsecured WiFi connections. 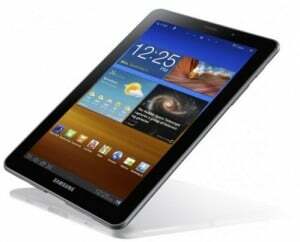 Many people using these tablets find the they need to get a good VPN for Samsung Galaxy Tab to keep their private information secure. A VPN is a Virtual Private Network that allows users to access the Internet on a secure network and prevent unwanted guests to intercept their data transmissions. With the rise in mobile devices and Internet usage, cyber crimes has also began to rise. This has caused many people to look for a Samsung Galaxy Tab VPN. The good thing about this new mobile device is that the Galaxy Tablet has a built in program so you can connect directly to a Samsung Galaxy Tab VPN. All you have to do is follow these simple steps and you can connect to a secured network through the VPN service of your choice. First, click on the home icon located on the front of the Samsung Galaxy Tab. Once there, press Menu and click on Settings. Scroll down until you see Wireless and Networks, then click on that. This will bring up the Settings menu. There you will find an Add VPN icon. Click on that icon and select the type of protocol you want to use for you Samsung Galaxy Tab VPN. You will need to already be registered with a VPN for Samsung Galaxy Tab to work properly, but once you have, you will know to enter the required information, such as the VPN provider’s name and the server used by the VPN. Just enter the information you find under the Add VPN icon. This will set up you Samsung Galaxy Tab VPN, but you still have to connect to the service. The final step is using a Samsung Galaxy Tab VPN service is connecting to that service. Use the same procedures as you did when adding a VPN service: Click Home, Menu and Settings, then Wireless and Networks. This will bring up you list of VPN settings and the VPN for Samsung Galaxy Tab will be listed. Just choose the VPN service will automatically come up and you will have to enter your information, such as user name and password, to complete the connection. Once you enter the members area of the VPN, you will be using a secured connection of the Samsung Galaxy Tab VPN. As you use your tablet, you will continually see a status bar on the front of the Samsung Galaxy Tab to show that you are still connected to the VPN. If you get disconnected, a disconnect notification will come up on the tablet and then ask if you want to return to your previous Samsung Galaxy Tab VPN settings. With so many VPN providers out there, it may be hard for you to find the right one for your needs. Do not worry. We have assembled a team of people to do all the research for you. After using and connecting to hundreds of providers, we have listed the top 5 Samsung Galaxy Tab VPN services. We listed each one in order from best to good. After looking at the ease of set up, number of countries each VPN service were located, the access speed or bandwidth, the protocols offered and cost, we came up with this list of Samsung Galaxy Tab VPN services. Tagged as: Samsung Galaxy Tab, samsung glaaxy tab vpn, vpn for samsung galaxy tab.